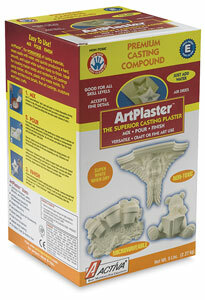 Activa Art Plaster, the workhorse of casting materials, mixes easily, is carvable, and takes exceptional detail. It has a durable surface and can be used for rigid molds. Its surface is super white, but it is denser than plaster of paris, and has superior working qualities. When it is dry, it can be painted or finished. Activa Art Plaster is packaged in a heavy-duty, resealable 5 lb canister, and is non-toxic.